Louisville Ballet Dancer Ryan Stokes and Louisville Orchestra Music Director Teddy Abrams. Photo by Sam English. To say I was excited to see this collaboration is an understatement. I have been a long time supporter of both organizations and have been watching and following each company’s growth for many years, especially in the past two, with the arrival of Teddy Abrams (Orchestra) and Robert Curran (Ballet). Of course, it is not unusual for an orchestra to play live during a ballet performance; that has been done for many centuries. It is just not done as often since the invention of magnetic tape. But Louisville has not had a collaboration like Spring Collaboration in a good, long time. Luckily our new orchestra and ballet Artistic Directors saw the drought and decided to do something about it. The Orchestra was placed on the Whitney Hall stage elevated and deep into its massive build, leaving a generous amount of stage for our Ballet to perform on. The first notes of Philip Glass’ Violin Concerto are given to a solo saxophone. Solo Saxophone? Yes. Instead of the written Violin solo, Maestro Abrams called upon the award-winning performer Amy Dickson to lend her saxophone skills to the highly complex rhythms, techniques, and arpeggios of this piece. The first of three movements begins with a dance like quality that the Ballet Company embraces, with pulsing chords that are repeated throughout the whole of the piece. The brass section delivers on some very tight harmonies that could cause even the slightest of imbalance should you not be paying attention. Within the second movement we hear note progressions and rhythms that are characteristically Glass, using the lower strings and woodwinds as a foundation of the movement that would, throughout the movement, build harmonies. In this movement there is not a competition of focus between the orchestra and the soloist, each given a chance to be the focal point. The third movement offers a return to the dance like feel of the second, even incorporating a Spanish feel in the theme using wood percussion. Pulse and tonality rises in both the orchestra and the soloist, still looking for the resolution, but it doesn’t come, instead gently sliding into a slower tempo and a return to the coda of the first movement. Ms. Dickson’s interpretation of the Violin solo teetered on composed and improvisational and was outstanding. I don’t believe that I will be able to listen to this piece the same way again. I am going to jump the order of music this time and discuss the immortal Petrushka. Written by Igor Stravinsky and considered one of the greatest ballets of the world, it was considered to be ahead of its time and written in-between his Firebird Suite and Rite of Spring. If you are not familiar with the story, Petrouchka (Petrushka) is Russia’s version of Pinocchio, the puppet who comes to life. Stravinsky composed this piece with a deep sense of Russian folk music, probably because of the story being a folk tale, with a forward piano part. The theater side of me really wants to share with you how charismatic and socially stirring I found this to be. Petrouchka is pivotal in music for many reasons. It is considered more progressive than Stravinsky’s Firebird and Rite of Spring and allows the listener to expand their ear to a different style of writing, even inviting something referred to as the Petrushka Chord (consisting of C major and F♯ major triads played together), a bitonality device heralding the appearance of the main character. Set in four scenes, the first is written in a way that seems like the musicians are taking turns with the melody but we then hear a flute solo as the puppet comes to life. In the second movement there is distinct dissonance which then leads itself to a delightful and danceable waltz in the third, highlighted by a fantastic trumpet solo, but not without a string and winds section that seem a little off, but is entirely written as such. In the last movement, where the Petrushka chord is heard most prominently, the finality of the piece leaves one with many questions (as does the ballet). This evening we were introduced to the World premiere Union, the collaboration of Teddy Abrams’ composition Unified Field and choreography by Adam Hougland. 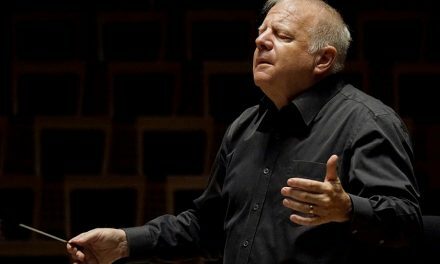 As Maestro Abrams explains in his program notes, he has not necessarily composed with dancing in mind in the past, so this was a challenge in that he thought of danceable rhythms and tempos. The beginning certainly had a Romantic feel to it, with rhythmic complexties that soon lent themselves to a fantastic discovery of many different musical styles. I heard hints of Irving Berlin, Gershwin, Americana, Gaelic….was that a jazz ensemble that I just heard? Yes, even a steel guitar, rhythmic drums, and organ are in the mix. Although the whole of the piece isn’t divided in noticeable movements like many other compositions, there were enough musical differences to hear discernable styles of writing; the final portion had a nod to bluegrass. I need to hear this composition again and again. As I was discussing it with a fellow audience member we both agreed that this was perhaps the best piece we’ve heard from the Maestro, and that is saying quite a bit. I will leave you with this: I was moved throughout the whole of the evening. Each performance made me excited and thrilled to be there and to be watching these talented musicians and dances along with a full audience who was just as excited to be there as I.
I certainly hope to see many more collaborations like these in the very near future. Find another review of this performance here.